The VIBEG agreement is assisting the implementation of the Nature2000 goals in the Nature 2000 areas Vlakte van Raan and North Sea Coastal Zone in The Netherlands. It incorporates the interest of the Dutch fishing industry. The agreement is the result of long and intensive discussions between the fishing industry, nature organisations and the Dutch Government. A steering group between the stakeholders in continuesly exchanging information and develops actions to improve the environmental situation. What measures are taken to improve the biodiversity in the Natura 2000 areas of the Dutch North Sea Coast? How can the finishing industry, nature organisations and governments work together on reaching environmental goals? Which zoning measures are developed along the Dutch North Sea Coast regarding fishing? 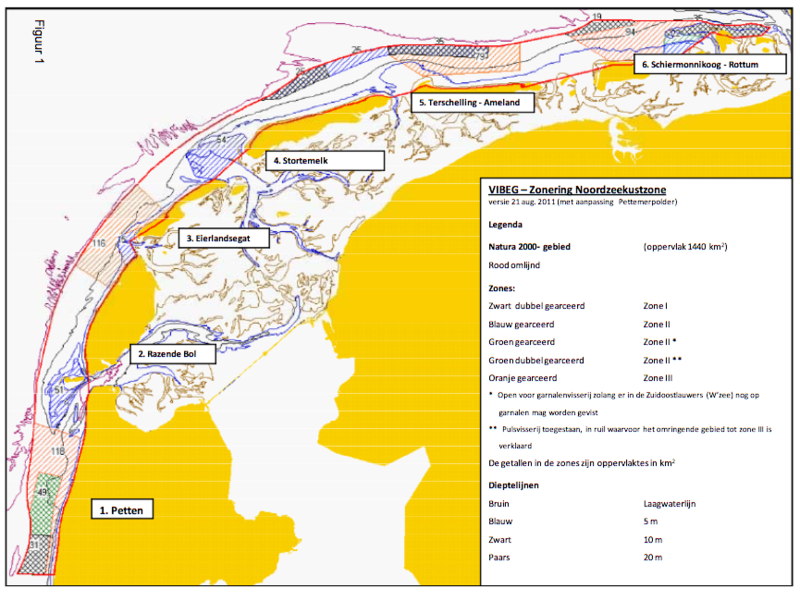 The Dutch North Sea coastal zone and the Vlakte van de Raan have been assigned Natura2000 areas on the 16th of March 2011. This means that the environmental quality of the areas needed improvement. Most important wasto make the fishing industry working in these area more sustainable, to improve the working of the ecosystem. The VIBEG agreement has been signed by representatives of the fishing industry. Thereby support is gained to actually implement successful measures. Agree on measures to protect the North Sea Coastal Zone and the Vlakte van de Raan. A framework in which measures for the fishing industry can actually be implemented successfully, focussing on making the industry more sustainable. Continuous cooperation and consultation between parties needs to be established with a responsibility of all relevant organisations. Develop the initiative to start discussing how the future plans will be shaped for these areas. An agreement with measures on the short and long term has been developed. These measures are explained more detailed here. A steering group set up by the Dutch Minister. As national and international policy is developed, its members inform and support one another. The group’s members represent the World Wildlife Fund, the North Sea Foundation, the Dutch Fish Product Board, the Federatie Vissersverenigingen (the Dutch federation of fishing associations), IMARES Wageningen and various departments of the Ministry of Economic Affairs, Agriculture and Innovation, and the Ministry of Infrastructure and Environment. Information is not restricted to the group’s members. On the contrary, on behalf of the Minister, discussions are held regularly with other parties who register their vested interest in the protected sites in the North Sea. These include representatives of Sportvisserij Nederland (Dutch anglers association), Greenpeace, the companies based at the ports, parties involved in offshore oil and gas and parties engaged in wind energy and windmill production. The following map shows the areas and the specific zones on the map. The VIBEG agreement, as well as the working group which fosters continious consultation between nature, fishing and government can be of an inspiration for other European nature 2000 areas that need to reach their goals to improve the ecological conditions. However, the institutional context of the Netherlands, being consensus oriented, might make it difficult to transfer this practice to other regions. Funding the programme is a common responsibility of the organisations (fishing industry, nature organisations and national government) that signed the agreement. They will look for additional funds where actions are necessary to achieve the goals set. Client: Ministry of Economic Affairs, Agriculture and Innovation.